My oldest daughter, Catherine, has what is called a "full figure". It has always caused a problem with finding ready-to-wear clothing that fit her properly. She has finally come to the realization that having a pattern fit *to her* would solve her problems. So, we engaged the services of a very talented sewing instructor, Jane Foster, and a muslin was created that would be the pattern for any fitted shirt. Even with the muslin expertly fitted by Jane, it is always advisable to make a test garment first, before the "real" fabric is used. I found a pale blue lightweight flannel (or maybe it was brushed cotton??) in my stash and made a long-sleeved shirt. 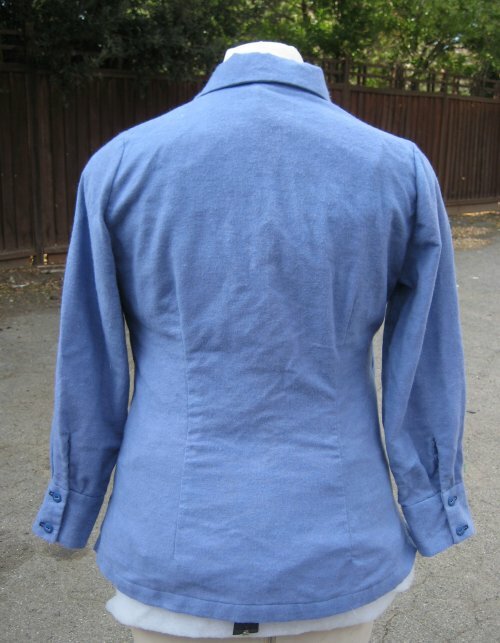 The long sleeves have a continuous placket for a finished look. The side seams feature a slit so the shirt can be worn outside the pants and still have ease of wearing. After trying the almost-finished shirt on, I marked where the buttonholes needed to be. On full-figured bodies, buttonholes need to be *horizontal* so any stress endured by the buttons and buttonholes will not cause the buttonholes to gap open and the button to become undone. 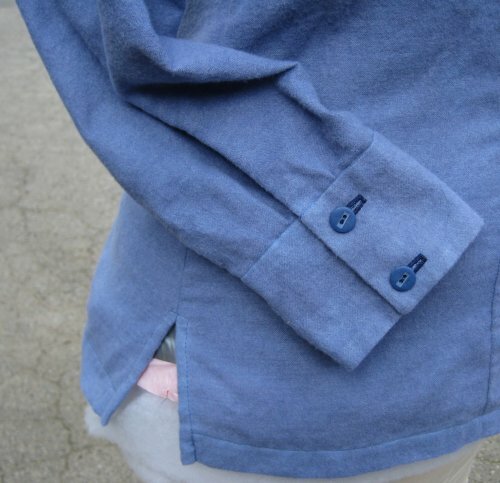 This is a frequent failing with ready-to-wear shirts; it is much more time-efficient to make the buttonholes vertically. But shirts made at home don't have that time restriction. I was pleased to see that the finished shirt fit Catherine absolutely *perfectly*! The darts were accurately placed, the shoulder point was where it should be, there was no stress folds anywhere. She looked gorgeous in the color. But ... she didn't like it. ::thunk head on wall:: Why? First, she doesn't like long sleeves. Say what? I didn't know that! And second, she doesn't like pastel colors. Well, I offered to cut the sleeves short, but that was declined. 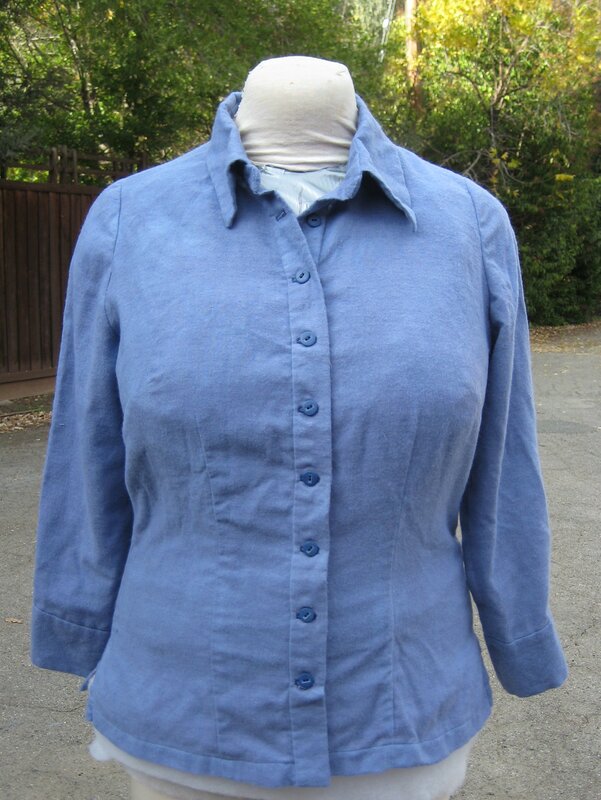 Then I took the entire pastel blue shirt and dunked it into a dark blue fabric dye. What you see is the final result ... a lighter color than I expected for the dark blue dye but definitely a darker blue than what it was originally. So, Catherine took the shirt, but I don't think she's wearing it. The next shirt will be *SHORT* sleeves and a dark green.